Kachchh Great Indian Bustard Sanctuary or more commonly known as the Kutch Bustard Sanctuary, is located in a quaint village in Jakhau in the Kutch district of Gujarat. It was declared a sanctuary back in the year 1992 with the objective of conserving and protecting the Great Indian Bustard one of the heaviest flying birds belonging to the avian family of Otididae. The Great Indian Bustard is also known as the Ghorad mainly among the locals because its height and weight is quite similar to that of an ostrich. Even though the bird can fly, it prefers staying on the ground either roosting or breeding.Apart from the Great Indian Bustard, there are many exotic varieties of birds found here. It is home to more than twenty varieties of resident and migratory birds at any given time. Youll spot McQueen's Bustard, lesser florican, bush chat, and the merlin. Other commonly found magnificent animals found here include jungle cat, chinkara, harrier, and the desert cat. Since this sanctuary is located on an arid landscape, rainfall is scanty and erratic here, receiving an average rainfall of about 384 millimetres. As a result, the sanctuary comprises of arid and semi-arid grasslands with scrubs, scattered bushes and some cultivation. 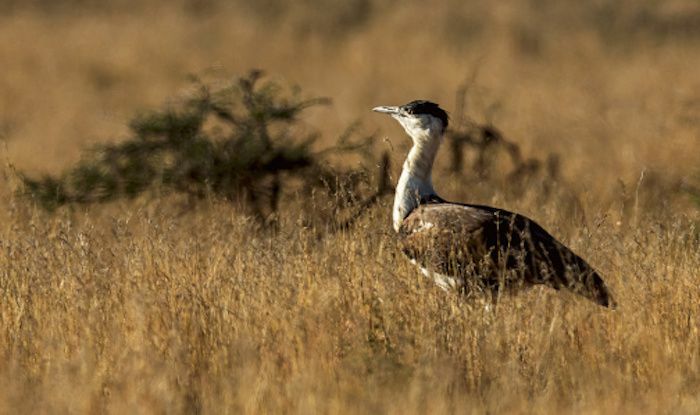 The bustard, mainly a terrestrial bird, has adapted to this habitat. Youll find it strutting about in its natural habitat, feeding on traditional agricultural produces such as bajra, jovar and other cereal crops as well as insects and reptiles.